We are nearing the Holiday season and preparing for a lot of entertaining. I love having family and friends over and I love to have a pretty table. Now it doesn't have to be fancy or elegant, just something that is pretty and shows my guests and family that I enjoy having them. We all know that some pretty dishes and glassware is essential, but there are a few other things that you really need to have in your stash so you can set a pretty and interesting tables for almost any occassion. We use our breakfast table every day for all our meals and it is where most of our company gathers too. I try to change things up often and have a few basics that I use over and over. 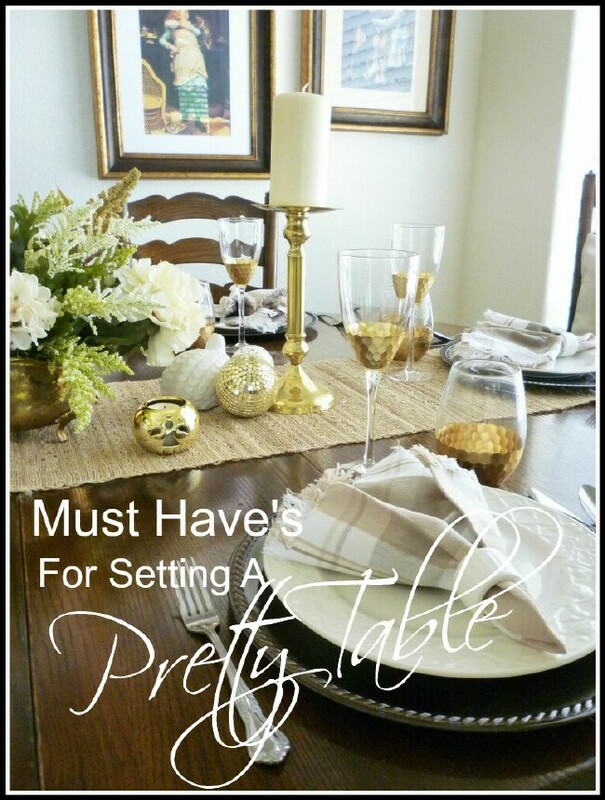 Here are a few ideas for you to use to create your own table settings whether it is for everyday or for company. 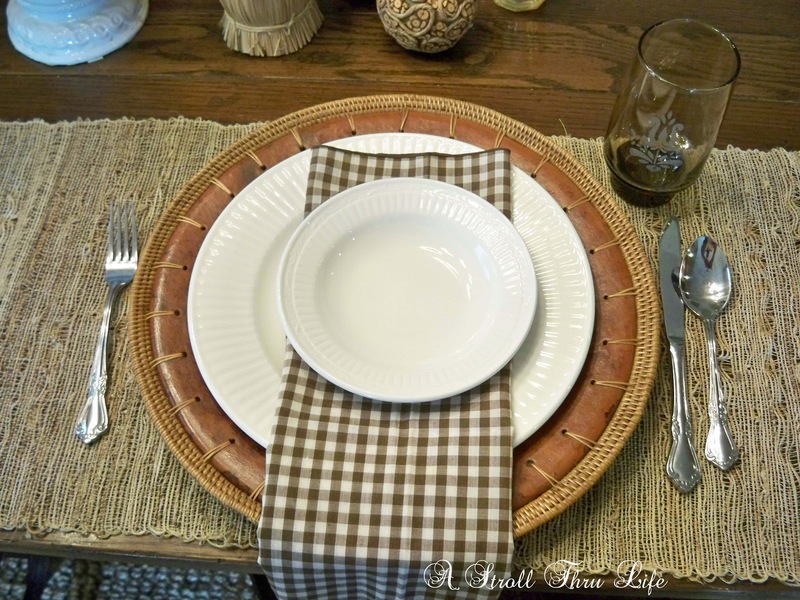 I rarely use a tablecloth, I much prefer to use a runner and my favorite ones are a woven grass type mat. I love this, it can be dressed up or down. Here you can see how I set a table with simple gold and white. Even though the runner and napkins are more casual, the glasses and and glitter balls give the table a more upscale look. Swap out the accessories and flowers and you have a totally different look. 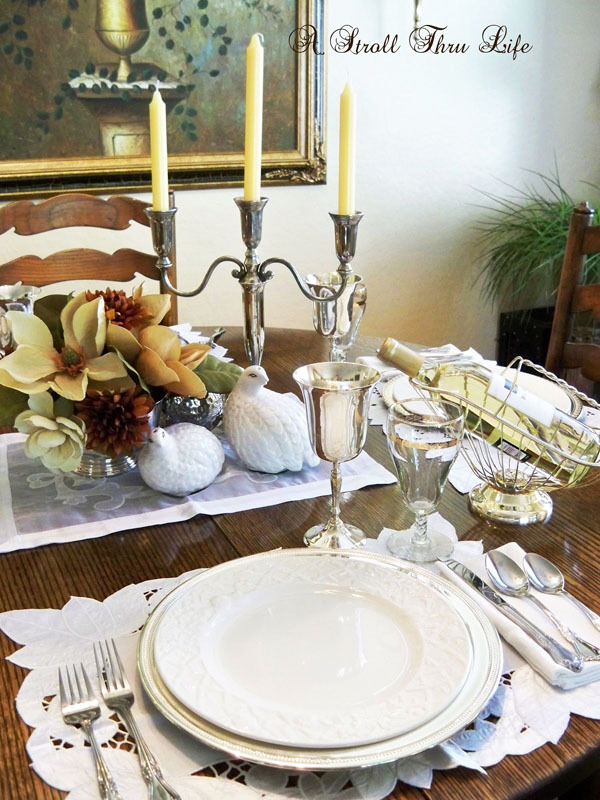 The runner keeps the table setting from feeling too formal. Take note of the hurricanes too. You can find these everywhere - add a Dollar Store candle and coffee beans and you have instant chic. You can see we are using the same runner and the same gold chargers for this setting. 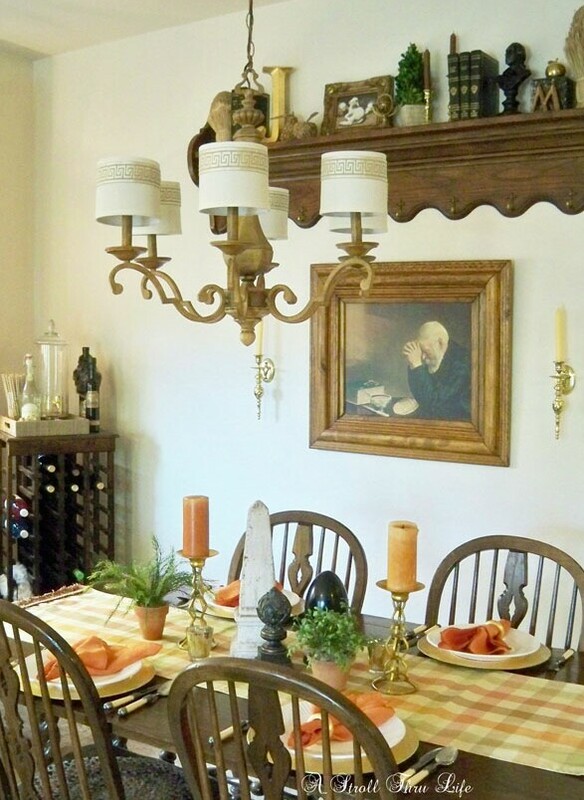 This is a glammed up version of a casual centerpiece by adding tons of thrift store brass candlesticks. They don't have to match. In fact the more different they are the better. The same runner only this time I used two. I love this idea for my harvest table, it really gives each place setting more importance. Again I am using all those same candlesticks, ivy and the two white ceramic pieces.. If you take a close look at these two settings you can see how you can totally change one basic centerpiece to create several different looks without reinventing the wheel. All I did was add the second runner, different napkins and take the sunflowers away. Sometimes a plaid or pattern is just what you want for a little more color. You can find all kinds of patterns at Ross, TJMaxx and of course Home Goods. It's also fun to use two runners and cross them over a table. This works especially well for a round table. There are all kinds of runners. I have a whole stash of cloth ones that I use and rotate in and out. I also like to use something different on occasion. The rug runner is a fun alternative. I wanted to create a sort of outdoor theme with the centerpiece since we were having a BBQ. Every once in a while I like to use a tablecloth. My table has 4 leaves and it can seat up to 12 so I do have a couple of table clothes that I use from time to time. I really like this check one. I also like to create a long centerpiece down the center of the table too. 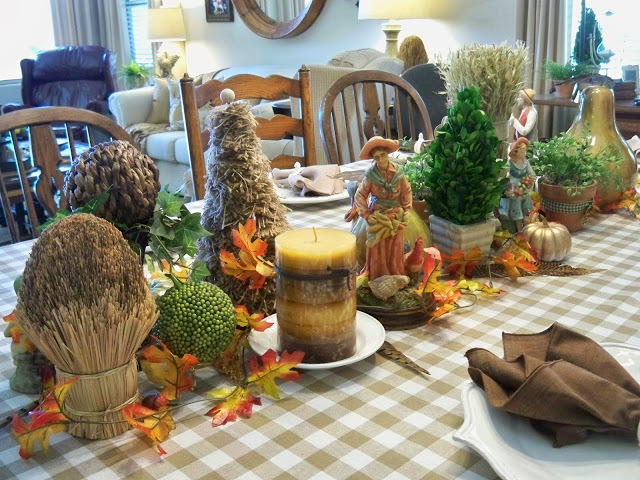 Think of your centerpiece as telling a story and I think this one says "Fall". 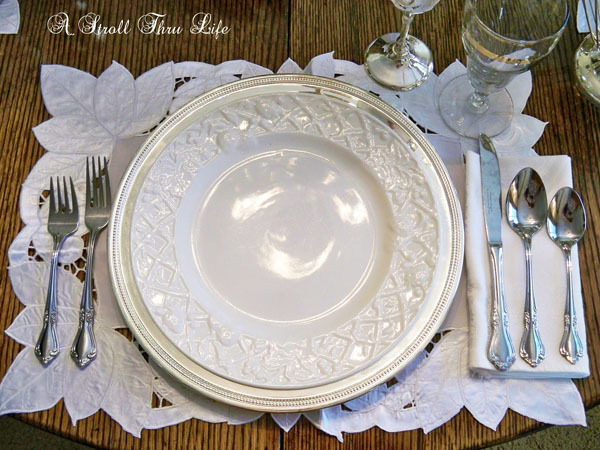 I do have a lace tablecloth that I found years ago at a thrift store that I use for more "fancy" table settings. Most of this came from either Goodwill, Thrift Stores or 99c Store. 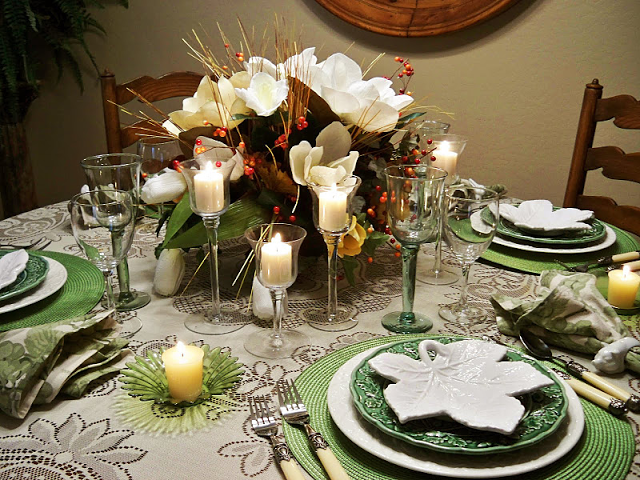 The clear and green wine glasses came from the 99c store along with the green votive candle holders and the green place mats. I found the napkins, white plates and the stem votive candle holders at Goodwill. The flowers are simple "fauxs" that I spruced up with some berries and grass from the 99c Store. You really can pull together a really pretty table for pennies if you just shop and think outside the box. I think both of these are essentials in any linen closet. Now you don't have to have a huge stash, just have some basics that you can use over and over again. I rarely do a "formal" type of table setting, but I do like to dress up the table for special occasions. I have two sets of pretty white place mats. 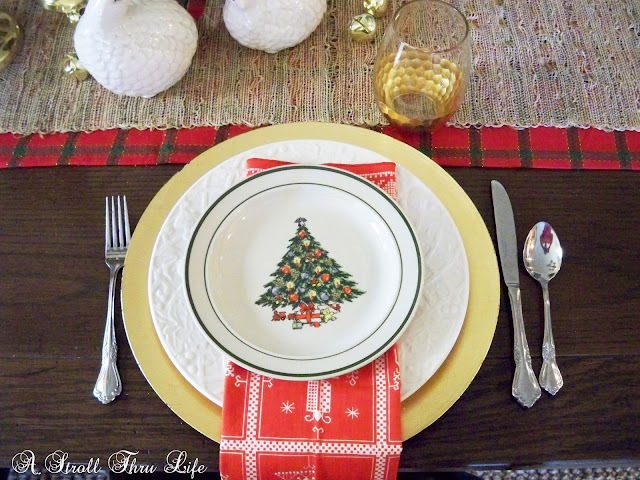 Here I use one of the place mats under my centerpiece and a different set for the place settings. 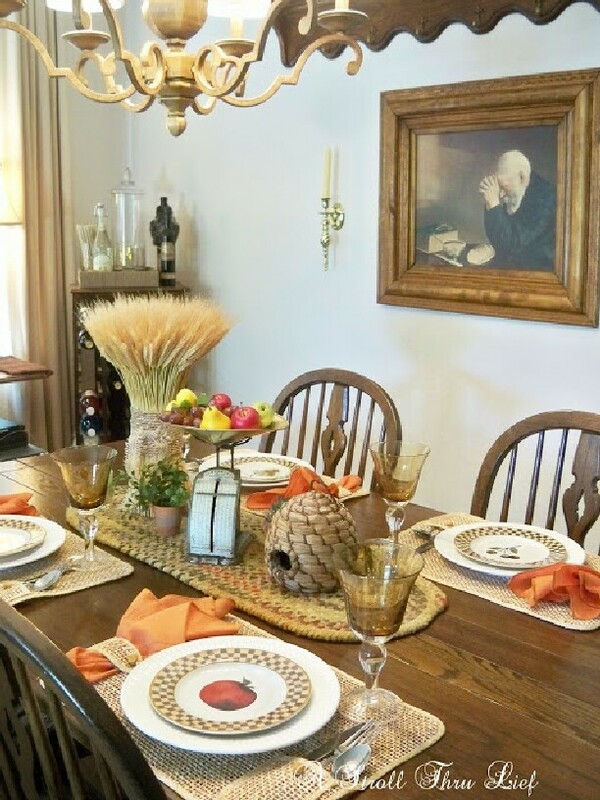 This is a table setting that I did last year - "Thanksgiving Table pulled right out of Goodwill". I also use a silver charger for a more elegant feel. These are silver trays that I found at goodwill. Seems like people are always donating them. I just collect a few so I can use them as chargers and then they can also double as serving pieces when I need them. Double duty is always perfect and less to store. When I saw these I just couldn't resist. How fun, these were labeled picnic place mats. I guess that would be really appropriate. I love them for indoors or outdoors. If outdoors and it is a little windy, your napkin will definitely stay in place. Probably my favorite chargers are these gold ones. You can find them almost anywhere and they are so inexpensive, but look good with any setting. Collect a few different salad plates to go with your white dishes, they totally change a setting in an instant. I've had these wood and wicker chargers for years. I love them. They also make fabulous trays to hold moss balls, spheres, Christmas balls and so much more on a coffee table. Of course wicker chargers are a basic staple too. Again these are appropriate for any table setting and also to be used as trays. These are great for serving bread. 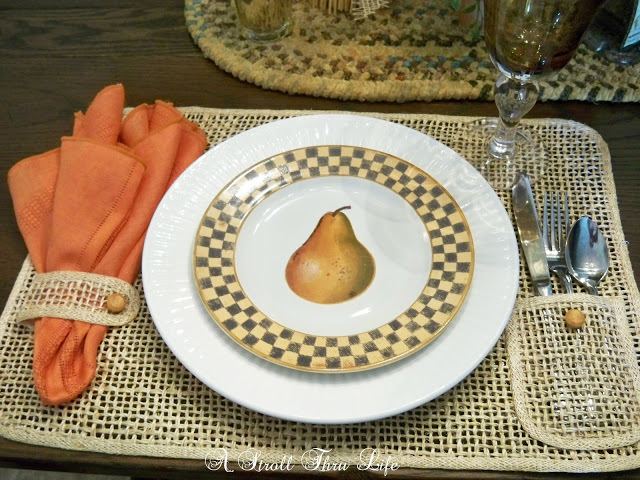 Now I don't need to show you a million different kinds of napkins, but having a great collection of different colors and patterns allows you to change up your tables in so many different ways. I usually just go for simple and not a lot of pattern. On occasion I like a jolt of color and plaids and checks are a favorite too. You can find napkins on sale at really reasonable prices at TJMaxx and Ross all the time, so having a variety is easy. In my previous home I kept mine stored in drawers and like to arrange them like files so I can see the colors, patterns and how many I have of each style. In my new house, I use the space under the stairs as my "Dish Room". It is fabulous to store a lot of my dishes, serving pieces and accessories such as pillow covers in the hanging rack and in the plastic bins I store all of my napkins and napkin rings. Lots of room for my candles and extra dishes, plus plenty of room for my trays and table runners on the top shelf. I love this closet, it is used every day. I just used metal shelving from the garage and created the most useful space for all my entertaining things. This small space in the back holds my cloches, hurricanes and party serving pieces. plus all kinds of room for my candles too. The purple plastic drawer unit that I had for my crafts now holds all of my napkins. It is so easy to see what I have and how many of each, plus which ones will mix and match if I need to set a table for 10 or 12. Having easy access to everything is key. I don't have to unpack half the house or dig through tons of cupboards to set a table. Find a closet or even a shelf in the garage like I had in my last house and put all of your entertaining things in one spot. You will find that you will use them all the time, not just for special occasions. I hope this helps you to always have a pretty table and one that you can use every day. Great ideas and suggestions. I just picked up more table runners from T.J.Maxx. I love using those. Your storage area is perfect for your dishes and accessories. I agree that having them stored somewhere so you can SEE WHAT YOU HAVE is key!! Love the "file" idea. Your cubby under the stairs is perfect. I have the same cubby in our basement and I call that our "luggage room". hummmm..... move the luggage, better use of that space might just be to make a "dish room" also! Great ideas Marty! I am working on storage here at the new house. Right now it involves just unwrapping everything and getting it on shelves. Then I will organize it all. I will enjoy having all our dinnerware set up so I can can just grab and go. You always set a gorgeous table, Marty! I know your family looks forward to meals at your house. You have always had just gorgeous tables, Marty...and it just goes to prove that something from the 99cent aisle can look as glamourous as a $100 place setting. I really like those woven "picnic" mats. They are fun and functional! ps-LOVE how you have all your accessories under the stairs like that. How perfect is that!!! This are all great tips Marty and just like you I'm more of a runner girl than a tablecloth girl! ;-) Love each one of your table setting too!!!!! You really have quite the talent for setting a gorgeous table, Marty! And I have to say I am super jealous of your ‘dish’ room - ooooh, I could use one of those! I don’t keep multiple sets of dishes because I don’t have anywhere to put them. 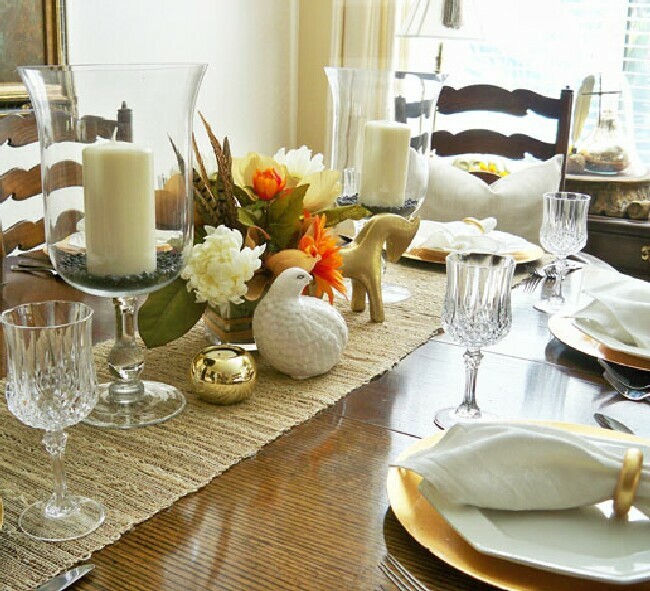 I do have a ton of linens and also candles, and other centerpieces, and it would be lovely to have them easily accessible when I want to set a nice table. Love the idea of the two runners, that’s awesome. Love your dish room, everything is so organized. Your tables setting are beautiful and I would love to sit at anyone of them. 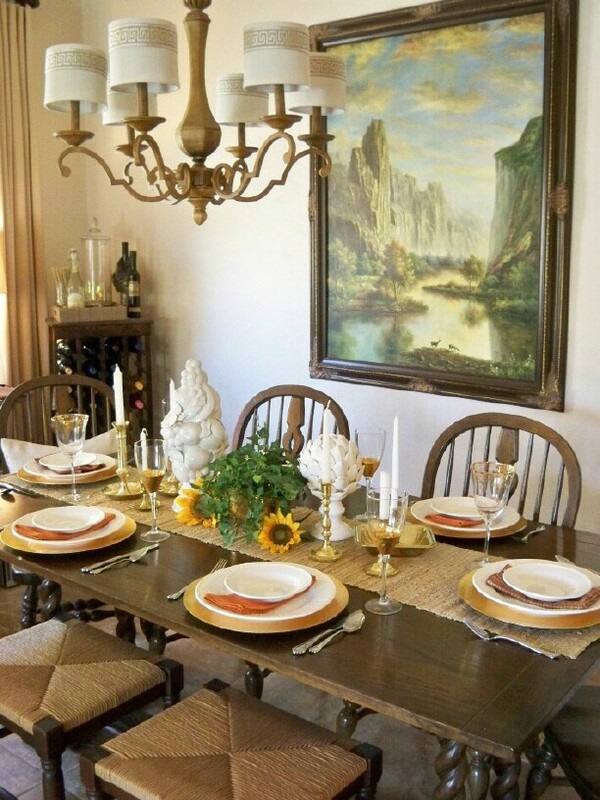 Thanks for sharing pictures of your beautiful table settings, very inspiring for sure.